In one of the greatest and most electrifying 800-meter races in New Jersey history, Luis Peralta and Drew Maher staged an instant classic at Sunday's New Balance Nationals Championships at Aggie Stadium on the campus of North Carolina A&T in Greensboro, N.C.
Peralta, a junior at Passaic, made a big move coming off the final turn to grab the lead from Kieran McDermott of Bel Air High School in Maryland. Meanwhile, Shore Regional's Maher, fifth at the bell, charged hard to get on Peralta's shoulder in the homestretch and the two battled to the line in one of the fastest two-lap races in state history. In the epic clash between Meet of Champions winners, Peralta, the M of C 800 winner, was able to just hold off Maher as they both linged for the line. Peralta, who hit the first 400 n 53.51. stopped the clock in 1:49.10!! The Penn State-bound Maher, the M of C 1,600 winner, was second in 1:49.16!! Maher had the fastest final lap split of 55.06. Perlata's 1:49.10 is No. 5 in state history, and Maher is now No. 6 on NJ's all-time list. This race marked just the second time in NJ history that two runners went under 1:50 in the same race. 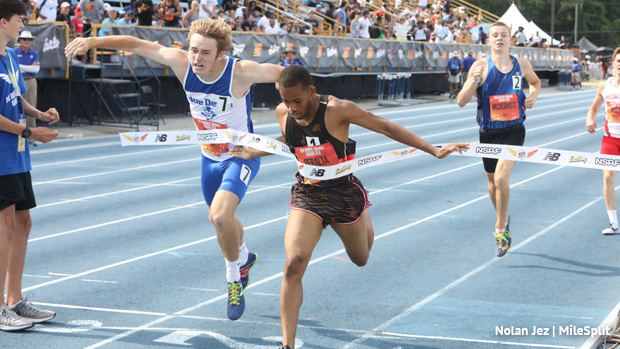 The only other time came at the 2014 M of C when Ishmael Muhammad of Oakcrest won in 1:48.52 and Joe White of DePaul was second in 1:48.75. With his time of 1:49.16, Maher, who the M of C 1,600 in 4:08.90, joined Olympian Robby Andrews of Manalapan as the only runners in state history to run under 1:49.5 in the 800 and under 4:10 in the 1,600. Andrews ran 1:48.66 for 800 and 4:03.49 for the mile as a high school senior in 2009. Peralta's win gave NJ a sweep of the 800 races. Athing Mu of the Trenton Track Club won the girls 800 in a NJ sophomore record 2:04.51, No. 3 in NJ history.